While science is starting to point out certain stretches and routines that may be harmful, it is generally agreed that the right stretches performed after a workout go a long way towards initiating recovery through gentle relaxation of tight and fatigued muscles. The problem is, no matter how much I educate my swimmers about the benefits of stretching, many still put in sub-par efforts at best. Some coaches have suggested I should threaten / punish them, but that’s doesn’t make the reluctant athletes change their mindset. I need to find a way to make them want to do it. Right? Nothing has worked so far. My guess is that right after a practice the swimmers are tired and their muscles are fatigued. And it’s right at this point that we’re asking them to voluntarily subject their muscles to more discomfort. While discomfort during swimming can be directly connecting with swim performance, which they want, discomfort during stretching is at best indirectly connected with swim performance. When I first started competing I was aware of only 2 types of stretches: Static and Ballistic. And we would do both types before and after practice. Static stretching is the most common type where you stretch a muscle for at least 20 seconds, and usually 30 seconds. 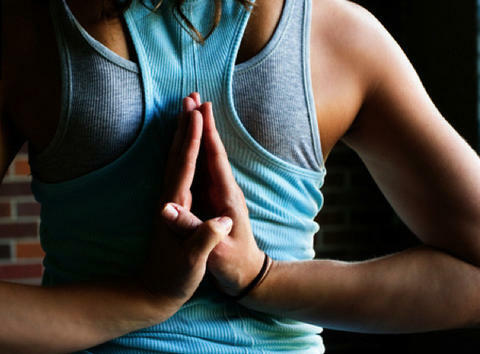 We were taught that about 2-3 seconds into the stretch our body protects the muscle be inhibiting the stretch, as well as adding pain signals to warn us the activity could cause damage. After 15 seconds or so, our body realizes everything is ok and releases the muscle, while stopping the pain signals. If we last through that 15 seconds then we can stretch without discomfort. 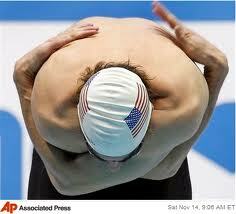 For swimmers these stretches often include trunk flexion, touching toes, and stretching the shoulders and lats. Back then we’d often try to touch our elbows behind our backs. If necessary, we’d have a teammate force our elbows to touch. Something that is now generally recognized as potentially damaging to shoulders. The second type was ballistic stretching, also called bouncing. This is when we’d swing our arms vigorously to stretch them farther, or touch our toes by forcing our body down fast. Far less painful but much higher potential for injury. As you can imagine from the above, traditional stretches involve discomfort on fatigued muscles, and are potentially damaging. It’s no wonder these aren’t popular! Functional stretching, sometimes called dynamic stretching has also become popular. This involves an exaggerated and relaxed Range-of-Motion movement mimicking an actual movement in the sport. The problem for swimmers here is that they’d have to be in the pool for this, and we usually use all of our pool time for training and cool down. We need to find stretches that are appropriate for the deck. There is one type of stretching that I was shown years ago, and it works incredibly well. Virtually no discomfort, and amazingly fast results. I can’t remember the name of it (the stretching is somewhat similar to Active Isolated Stretching), so we just call it 3-second stretching. Here’s how it works. We’ll use toe touching as an example. Bend down and reach for your toes. Don’t bounce down into it, but be fairly aggressive in the stretch. Hold it for a full 3 seconds, and then stand back up. Relax for about 7 seconds. Repeat 8 times. Each time you go down you should be able to go a little farther. Notice that with a stretch of only 3 seconds, the body hasn’t started protecting the muscle yet, so this means we can stretch farther and without discomfort. It’s effective as well, as we’ve had kids touch their toes within 2 weeks using this technique, when they hadn’t touched their toes in years. The biggest problem, if you can call it one, is that stretching the various body parts that need it can take 7 or 8 minutes. Far longer than my swimmers are willing to tolerate. So here we are. Effective stretching with almost no discomfort, and yet most swimmers STILL minimize or avoid them whenever possible. I never did much (any) stretching after running until after I started spinning sessions. The leader (my wife’s personal trainer, too) had us do a short series of stretches after an hour’s cycling. I started to do them after my runs. The arm ones I can do while I’m doing my cool down walk (extended arm, triceps stretch, gentle neck stretch). The leg ones (standing quadricep, hamstring, calf, achilles, etc) I do either at the picnic table in the park near my house or on the porch. I end with bending over and gradually straightening up “one vertebrae at a time”. Easy to remember, easy to do and, so far, my leg muscles aren’t sore the next day – especially after a long or a “hills” run. I am now in charge of our club’s dryland training. When I run it I lead the stretching before and after (and often do the workout with them). Lead by example. On the times when the head coach has asked me to lead the stretching on deck, they do it. Food for thought – what about quantifying gains in flexibility (choose one or 2 stretches that are easily measure ie) touching toes and correlating changes to performance/swim times over time. When my son attended a specialized ski school at the beginning of each school year they not only measured their fitness but also their flexibility. Each month they reviewed fitness and flexibility changes with the athletes and related those changes to performance. It could be as formal as what fits for the level of swimmer etc. I like that idea, Aimee. Testing is the easy part. It’s relating it to swim performance that could be a problem, especially as we’re finding out more about old stretching exercises that are actually damaging to shoulders. I certainly don’t have the knowledge to create any causation relationships between stretching and performance. Sounds like an excellent research study for somebody! I heard about Dara Torres incorporating ki hara stretching 3 times a week. Your thoughts on this? I don’t think its supposed to be done right after swimming but is a 10-15 workout in itself which can be done 3 times a week. Thanks, Rick. It’s good to be reminded about basics. I did hate stretching when I was a kid but I learned to understand its importance thanks to friends and coaches . Love and hate affair through all my life until today. By the way, I remember old (some 30 years ago) interview with one Soviet gymnast who was phenomenal in her flexibility. She said that positive and kind attitude (towards oneself and others, etc.) was key element for her. Never stretch with anger and rage. Useful advise, in my opinion.